World's Greatest Comics is always buying collections of comic books from the 1930's, 1940's, 1950's and 1960's through 1975. Superhero, Horror and Science Fiction comics especially wanted, but other types and comics from later years will be considered. If you are looking to sell a collection, call us first! We will work with you, and make you a competitive offer that is fair to both of us. Call us before you sell to the big used bookstore chain! Comic books are what we do, and *not* just a sideline! 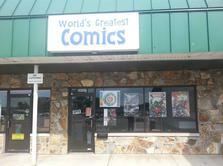 In addition, our staff has over 50 years combined experience in the comic book retail field. Worried about answering an anonymous ad and meeting up with a stranger in a parking lot? We're an established, full-time place of business, and we'll gladly look at your collection in-store, or travel to your location, in or out of Ohio, to view quality collections. For a quick response, call Jeff at (614) 891-3000.